This Weekly Routine will DRAMATICALLY help fight wrinkles, just try! Start saying the vowels with an intense expression, do it five times, then wash your face with oat water; perform an inverted smile 5 times and then cover your face with a fine layer of honey; open your mouth wide for 5 seconds and then tightly close it for another 5 seconds, repeat 5 times then remove the honey with whole milk; wash with abundant fresh water until is perfectly clean. 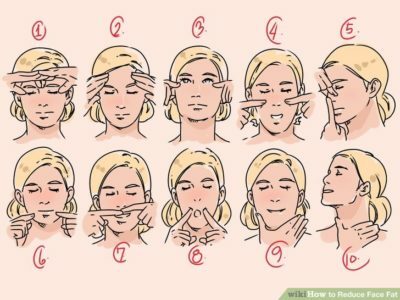 Using two fingers slightly stretch your eyes slanting them, like Chinese eyes and hold for 5 seconds, repeat 3 times, apply a fine natural yogurt layer around them; fully pump with air your cheeks for 5 seconds and repeat 3 times, remove the yogurt around your eyes and apply some olive oil on your cheeks; wash with abundant fresh water after a few minutes. Press under your eyes pointing to your nose, your index fingers are the right ones to use and should be at the middle under your eyes, put your lips inside your mouth like hiding your teeth, watch to the roof and blink 30 time, repeat it twice and then put two cold cucumber slices over your eyes for 5 minutes, wash them after with abundant water. Cares your neck to the bottom meanwhile your head inclines backwards then move your head forward and repeat twice, do not forget to use olive oil to lubricate meanwhile doing this, clean with cotton and abundant fresh water. Monday´s exercises are to avoid wrinkles around your mouth, Wednesday exercises are to get rid of crow´s feet, Friday exercises are to avoid dropping lids and brows, Sunday exercise is to keep your neck smooth. These are perfect exercises either for mornings or nights, even both: Mornings & Nights. We have more than 30 muscles in our face and it is important to exercise them to promote blood circulation and toxins elimination, result: stay young. So just invest a few minutes of your time with these simple but invigorating exercises and you will see a big difference. Hey! One more thing, always have a mirror when doing them. Wrinkles ? Blame it on your mother!